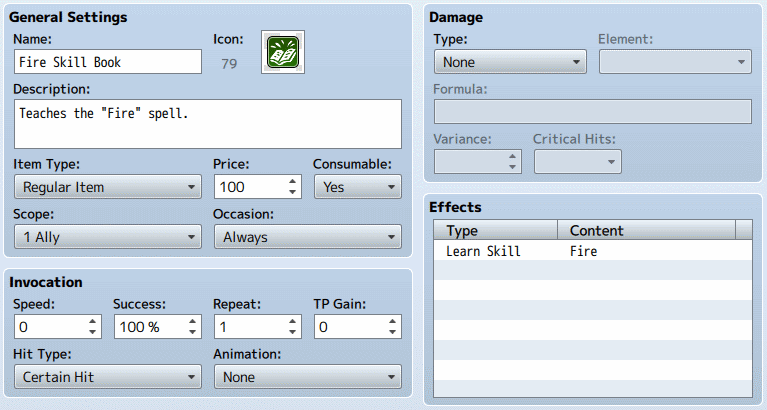 In RPG Maker, you can assign effects to items or skills. Effects are special behaviors that occur when the item or skill is successfully executed. For example, you can create a “Poison” skill that has a 50% chance to add a “Poison” state to the target, or you can create a “Skill Book” item that will teach a new skill to a particular actor when that actor is selected. Now, let’s say you had a skill book that teaches Fire, but only magic users can learn it. Do you want non-magic users to be able to use the book as well? Maybe not. In this situation, it would be useful to be able to define “conditions” that must be met in order for the skill book to be used. 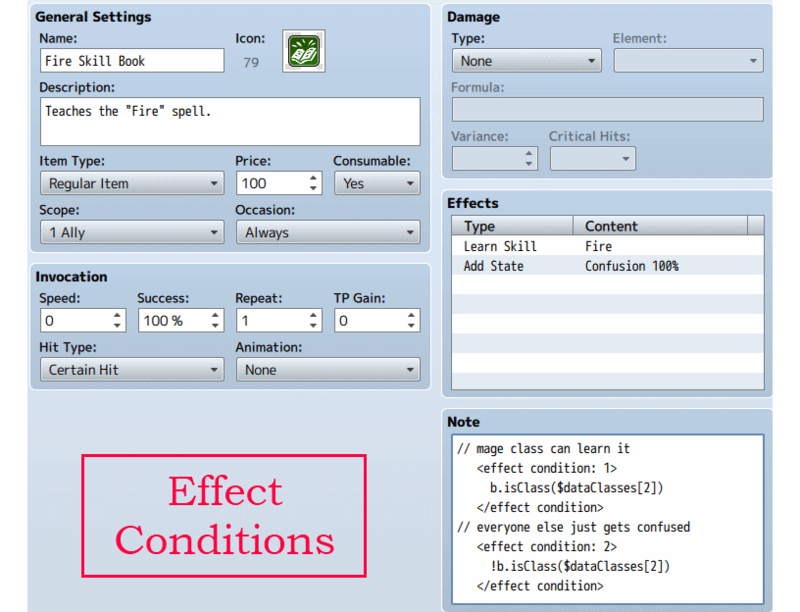 This plugin allows you to define “effect conditions”, which are conditions that are given to each and every effect on an item or skill. Before an effect can be applied, all conditions must be met. 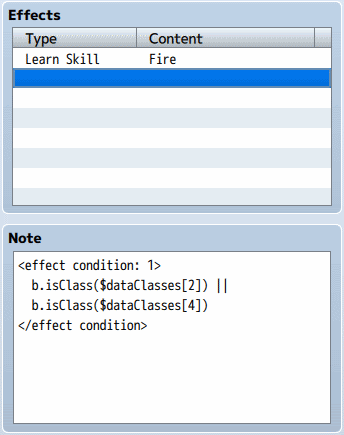 With these conditions, you can now check whether the actor that you would like to use it on is able to learn Fire! Effect conditions are formulas, so you can create conditions on anything that you can imagine. Download the plugin and place it in the “plugins” folder in your project’s “js” folder. Then open your Plugin Manager (F10), double-click an empty row, and select the HIME_EffectConditions plugin. FORMULA is the condition that will be added to the specified effects. IMPORTANT: effects are applied in order from top to bottom. They are also applied AFTER damage evaluation. So for example, if your condition is on HP, the HP damage will be applied BEFORE your condition is evaluated. This timing may result in some odd behaviors if you don’t account for it. Let’s say you had an item called “Fire Skill Book” whichteaches the “Fire” spell. You would add one effect to the item called “Learn Skill” that will add the fire spell. Now, if you used the book on anyone, you’ll see that they learn the fire skill. We would like to add conditions for our “Learn Skill” effect now. Let’s say that only the “Magician” and “Wizard” classes can learn it. is the target class 2 or class 4? If any of those conditions are true, our effect condition is satisfied, and we can proceed to teach the target the fire spell only to actors that are class 2 or class 4. I want to use this plugin in my commercial game.But my English is not very good, I’m sorry. So how would you check a variable as a condition? 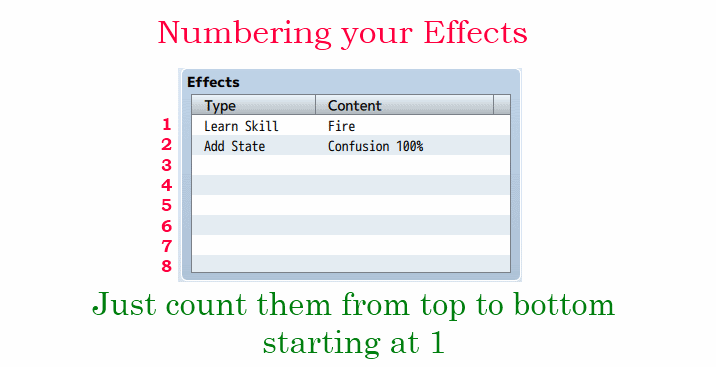 Say for instance I wanted an item that had different effects based on the value of a variable, and I needed to know if it was greater than 0 AND less than 3, how would you do something along those lines? I’m trying to get this plugin to work in tandem with your scope change plugin. Is there any way to change the scope of a condition? An effect, rather. I’m tired. I’m encountering a problem when using Enemy Classes to give enemies a class for use in an effect condition. When the skill is used by an enemy, the produced error is “undefined is not a function” When the same skill is used by an actor, the error doesn’t occur. I already tried putting the two plugins alone and the error still occurred when an enemy used the skill. How would I make it so enemies using the skill can’t apply an effect until a switch is turned on, but actors can even if the switch is off? Which means the condition is met if the user is an actor, or the user is an enemy and switch 3 is ON. Thanks so much for this, been trying to get a favorite food system working where certain foods heal certain actors more than others, this script finally made that possible. Thanks a ton! Sounds like an interesting mechanic! How to make it so item not consumable when doesn’t meet the requirements? How are you using the item? It should be unusable if it doesn’t do anything I think unless you’re in battle. Ah sorry i don’t know why but it works now! thank you very much, sorry to bother you! And putting that in the effect condition. I have written a formula reference that may be useful. hello princess. first a big ty and cheer for all your work on RPG Move. hope you okay I do have a question I am looking for something that have elemental status effect. lets say I wanna create a burn status effect which gradually exhaust the target. naturally I would want that elemental effect to have the target receive 2x damage from fire physical attacks or fire magical attacks on hit only not from thunder or ice or etc attributes. If i set the parameter to magical damage it affects every attributes where i don’t want that really (”.) I’m sorry if there is already something like that somewhere please do help me I am new to the rpg world all I could figure out is that the damage taken will be from any attributes which is bad. thank you so much. have a nice day. Can this be used to have equipment affect a skill’s damage? No, since effects are separate from damage. However, you could have equipment affect a skill’s effects though, which could have “damage”-like properties like removing a certain % of HP.